This article will explain the actual concepts of Backward Propagation Neural Networks - in such a way that even a person with zero knowledge in neural networks can understand the required theory and concepts very easily. The related project demonstrates the designing and implementation of a fully working 'BackProp' Neural Network library, i.e, the Brain Net library as I call it. You can find the theory, illustration and concepts here - along with the explanation of the neural network library project - in this article. Also, find the full source code of the library and related demo projects (a simple pattern detector, a hand writing detection pad, an xml based neural network processing language etc) in the associated zip file. Appendix A: Small Dose Of Spiritual Programming!! Solution Architect: "Well, you learned something about neural networks?" (Dumb?) Developer: "No, I'm smart enough. I love using other's code." Solution Architect: "But, if you don't understand the concepts, how you can optimize and re-use other's code?" (Dumb?) Developer: "Err.. I feel that most others can code better than me, so why should I optimize?" Understand in more detail, the design and source code of BrainNet library. Understand in more detail, how to use BrainNet Library in your projects. Put forward some concepts to optimize and generalize BrainNet library. Now, let me answer some questions I got in past. Q) Why you selected an object oriented programming model for this Neural Network Library? Answer - The focus is on the understandability of basic concepts, not on performance. Q) Is this neural network library fully optimized? Q) Whether this library can be used in projects? You can use it - as long as your usage confronts to the specifications in the associated license notice (see the source code). Anyway, I request you to send me a notification (and the modified code), if you hack it or use it in any of your projects. This article is complete by itself. It explains what is a neural network, and how to create one your own. How ever, to get an idea regarding what a neural network can do, and to get a user level experience - please read the first part of this article. The first article in this article series is titled "BrainNet Neural Network Library - Part I - Learn Neural Network Programming step by step And Develop a Simple Handwriting Detection System". If you are really a beginner, it will help you a lot, and may provide you a step by step approach towards understanding neural networks. This is my second article about Neural Networks in general and the BrainNet Neural Network Library in particular. This article explains Neural Networks and their working in more detail, and in a very simple way. Then I will explain the design concepts of BrainNet library. Tip - In this article, the theory about neural networks is explained in the most simplest (human readable) manner, so that even a person with zero background in neural networks can understand it. So, if you already know some theory about neural networks, you may consider skipping the theory part, and go ahead to the designing part which describes the design concepts of BrainNet library. One fascinating thing about artificial neural networks is that, they are mainly inspired by the human brain. This doesn't mean that Artificial Neural Networks are exact simulations of the biological neural networks inside our brain - because the actual working of human brain is still a mystery. The concept of artificial neural networks emerged in its present form our very limited understanding about our own brain ("I know that I know nothing"). Brain Net Neural Network library is designed and implemented using Object Oriented Concepts. Before understanding how neurons and neural networks actually work, let us revisit the structure of a neural network. As I mentioned earlier, a neural network consists of several layers, and each layer has a number of neurons in it. Neurons is one layer is connected to multiple or all neurons in the next layer. Input is fed to the neurons in input layer, and output is obtained from the neurons in the last layer. Fig: A Fully Connected 4-4-2 neural network with 4 neurons in input layer, 4 neurons in hidden layer and 2 neurons in output layer. An artificial neural network can learn from a set of samples. For training a neural network, first you provide a set of inputs and outputs. For example, if you need a neural network to detect fractures from an X-Ray of a born, first you train the network with a number of samples. You provide an X-Ray, along with the information that whether that particular X-Ray has a fracture or not. After training the network a number of times with a number of samples like this (probably thousands of samples), it is assumed that the neural network can 'detect' whether a given X-Ray indicates a fracture in the born (This is just an example). The concept of training a network is detailed in my first article. Later, in this article, we will discuss the theory behind network learning. As we already discussed, the basic component in a neural network is a neuron. First of all, let us have a very brief look towards biological neurons, and their corresponding artificial models. First of all, let us have a look at a biological neuron. Frankly, I don't have much knowledge regarding the actual structure of a biological neuron - how ever, the following information is more than enough at this stage for us to get in to the groove. A biological neuron will look some what similar to this. Dendrites - Dendrites are hair like extensions of a neuron, and each dendrite can bring some input to the neuron (from neurons in the previous layer). These inputs are given to the soma. Soma - Soma is responsible for processing these inputs, and the output is provided to other neurons through the axon and synapses. Synapses - Synapses of one neuron is connected to the dendrites of neurons in the next layer. The connections between neurons is possible because of synapses and dendrites. A single neuron is connected to multiple neurons (mostly, all neurons) in the next layer. Also, a neuron in one layer can accept inputs from more than one neuron (mostly, all neurons) in the previous layer. Now, let us have a look at the model of an artificial neuron. An artificial neuron consists of various inputs, much like the biological neuron. Instead of Soma and Axon, we have a summation unit and a transfer function unit. The output of one neuron can be given as input to multiple neurons. Please note that for an artificial neuron, we have a weight value associated with each input. Now, let us have a look at the working of a neuron. When inputs are fed to the neuron, the summation unit will initially find the net-value. For finding the Net Value, the product of each input value and corresponding connection weight is calculated. 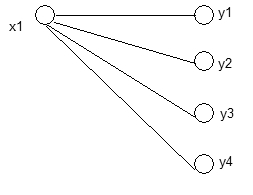 i.e, input value x(i) of each input to the neuron is multiplied with the associated connection weight w(i). In simplest case, these products are summed and fed to the transfer function. See the pseudo code below, it is simpler to understand. Also, a neuron has a bias value, which affects the net value. A bias of a neuron is set to a random value, when the network is initialized. We will change the connection weights and bias of all neurons in the network (other than neurons in the input layer), during training phase. I.e, if x is the input, and w is the associated weight, then pseudo code for net value calculation is as follows. Transfer function is a simple function, that uses the net value to generate an output. This output is then propagated to the neurons in the next layer. We can use various types of transfer functions as shown below. Hard Limit Transfer Function: For example, a simple hard limit function will output 1 if net value is greater than 0.5, and will output 0 if the net value is lesser than 0.5 - as shown. Sigmoid Transfer Function: Another type of transfer function is a sigmoid transfer function. A sigmoid transfer function will take a net value as input and produce an output between 0 and 1 as shown. The implementation of summation unit and transfer function unit may vary in different networks. This, a neural network is constructed from such basic models, called neurons, arranged together in layers, and connected to each other as explained earlier. Now let us see how all these neurons work together, inside a neural network. Training the network - by providing inputs and corresponding outputs. In this phase, we train a neural network with samples to perform a particular task. Running the network - by providing the input to obtain the output. In this phase, we will provide an input to the network, and obtain the output. The output may not be accurate always. Generally speaking, the accuracy of the output during running phase depends a lot on the samples we provided during the training phase, and the number of times we trained the network. This section explains how the training takes place, in a back ward propagation neural network. In a backward propagation neural network, there are several layers, and each neuron in each layer is connected to all neurons in the next layer. For each connection, a random weight is assigned when the network is initialized. Also, a random bias value is assigned to each neuron during initialization. Training is the process of adjusting the connection weights and bias of all neurons in the network (other than neurons in the input layer), to enable the network to produce expected output for all input sets. In the above network, N1 and N2 are neurons in input layer, N3 and N4 are neurons in hidden layer, and N5 is the neuron in output layer. The inputs are fed to N1 and N2. Each neuron in each layer is connected to all neurons in next layer. We call the above network a 2-2-1 network, based on the number of neurons in each layer. Tip - The concepts we are going to discuss here is largely biased towards a commonly used neural network model called Backward Propagation Neural Networks. How ever, you should understand that various other models also exist - like Counter Propagation Neural Networks, Kohanen's Self Organizing Maps etc. The above diagram will be used to illustrate the process of training. First, let us see how we train our 2-2-1 network, the first condition in the truth table, i.e, when A=0, B=0 then output=0. Initially, we will feed the inputs to the neural network. This is done by simply setting the output of neurons in Layer 1, as the input values we need to feed. I.e, as per the above example, our inputs are 0,0 and output is 0. we will set the output of Neuron N1 as 0, and the output of N2 is set to 0. Have a look at this pseudo code, and it will make things clear. Inputs is the input array. The number of elements in Input array should match the number of neurons in input layer. We have already seen how we calculate the output of a single neuron. As per our above example, the output of neurons N1 and N2 will act as the inputs of N3 and N4. Finding the output of neural network involves, calculating the outputs of all hidden layers and output layer. As we discussed earlier, a neural network can have a number of hidden layers. UpdateOutput() function of a single neuron works exactly as we discussed earlier. First, net value is calculated by the summation unit, and then it is provided to a transfer function to obtain the output of the neuron. Pseudo code is again shown below. I.e, as per our above example, let us calculate the net value of neuron N3. We know that N1 and N2 are connected to N3. Now, let us see how we are generating the output, using Transfer unit. Here, we are using the sigmoid transfer function. This is exactly as we discussed earlier. Now, the output of N3 and N4 will be passed to each neuron in the next layer as inputs. This process of propagating the output of one layer as the input to the next layer is called forward propagation part in the training phase. Thus, after step 2, we just found the output of each neuron in each layer - starting from the first hidden layer to the output layer. The output of the network is simply the output of all neurons in the output layer. In this step, we will calculate the error of the network. Error or Delta can be stated as the difference between the expected output and the obtained output. For example, when we find the output value of the network for the first time, most probably the output will be wrong. We need to get 0 as the output for inputs A=0 and B=0. But the output may be, some other value like 0.55, based on the random values assigned to the bias and connection weights of each neuron. Now let us see, how we can calculate the error. Let us see how to calculate the error or delta of each neuron in all the layers. First we will calculate the error or delta of each neuron in the output layer. This process is continued, till we reach the first hidden layer (delta of input layer is not calculated). Please note one interesting point. In Step 2, we are propagating values forward - starting from the first hidden layer to the output layer, for finding the output. In Step 3, we are starting from the output layer, and propagating the error values backward - and hence, this neural network is called as a Backward Propagation neural network. Now, let us see how the error factor is calculated for each neuron. The Error Factor of neurons in output layer can be calculated directly (since we know the expected output of each neuron in output layer). Simply speaking, a neuron in a hidden layer is using the delta of all connected neurons in next layer, along with the corresponding connection weights, to find the error factor. This is because, we don't have any direct parameters for calculating the error of neurons in the hidden layer (as we did in the output layer neurons). Remember - To calculate the output of a neuron, we used the outputs of connected neurons in previous layer, along with the corresponding connection weights. To illustrate this, consider a neuron x1 (ThisNeuron), which is a hidden layer neuron. X1 is connected to neurons y1, y2, y3 and y4 - and these are neurons in next layer. Thus, after finishing step 3, we have the Delta of all neurons. After calculating the delta of all neurons in all layers, we should correct the weights and bias with respect to the error or delta, to produce a more accurate output next time. Connection Weights and Bias, together are called free parameters. Remember that a neuron should update more than one number of weights - because, as we already discussed, there is a weight associated with each connection to a neuron. UpdateFreeParams() function simply does two things. Now let us see how to update the connection weights. The new weight associated with an input neuron can be calculated as shown below. As a neuron can have more than one input, the above step should be performed for all input neurons connected to this neuron. Now, after step 4, we have a better network. This process is repeated for all other entries in the AND truth table - for probably more than thousand number of times, to train the network 'well'. How ever, it is important to note that the network should be trained with sufficient samples (and sufficient number of times), to obtain desired results. Anyway, it is almost impossible to say that the output of a neural network will be 100% accurate for any input. Now, let us see how these concepts are implemented in BrainNet Neural Network Library. The fundamental challenge for any solution developer is to create, build or assemble a working program from his abstract concepts about a system. The quality of this transformation depends a lot on how well he understand the system. At this point, I would like to mention that Brain Net Library is actually not designed after a complete and thorough understanding of various existing neural network models and emerging possibilities in the area of neural networks. Hence, I suspect that the present design of this framework is mostly biased towards Backward Propagation systems I explained earlier - though it can be modified to create other neural network models also. We are simply mapping the above concepts to the library. Hence, the following code and explanation is very easy to understand, if you read the above concepts regarding Neural Networks. Now, let us have a look at some of the interfaces and classes in BrainNet library. Have a look at this model below. Please not that this model holds only the major interfaces and classes with in the model. As we discussed earlier, a Neural Network consists of various Neuron Layers, and each Neuron Layer has various Neurons. A Neuron has a strategy - which decides how it should perform tasks like summation, activation, error calculation, bias adjustment, weight adjustment etc. A Neuron has a strategy, and a strategy should implement the INeuronStrategy interface. We have a concrete implementation of INeuronStrategy, called BackPropNeuronStrategy (for a backward propagation neural network). A Neural Network is initialized and connections betweens layers are made by a neural network factory. A Factory should implement the INetworkFactory interface. We have a concrete implementation of INetworkFactory, called BackPropNetworkFactory, for creating Backward Propagation neural networks. The major interfaces in the model are briefed below. The major classes in the model are briefed below. The class is to help the user to initialize and train the network. It maintains a list of training data elements. 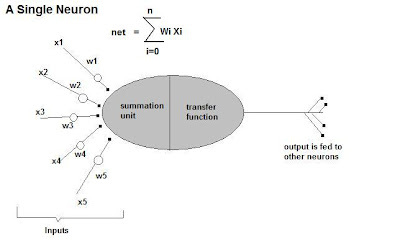 The INeuron interface provides an abstract interface that should be implemented to create a concrete neuron. I request you to refresh the concepts of an artificial neuron we discussed earlier. The elements in INeuron interface is detailed below. A concrete neuron will implement the INeuron interface. Neuron class is a concrete implementation of INeuron. The Strategy property of a Neuron holds its current strategy. Inputs property holds the references of Neurons (in previous layer) connected to this neuron. ForwardConnections holds references to the neurons (in next layer) to which this neuron is connected. Now, have a look at the Neuron class by extracting the source code zip of BrainNet library. Let us inspect three major functions implemented in the Neuron class - UpdateOutput, UpdateDelta and UpdateFreeParams. These functions are called by the NeuralNetwork class, by training and running the network. We will see later how the functions in NeuralNetwork class call these functions. These functions uses the current strategy object of the neuron to perform operations. UpdateDelta - Find the new delta of this neuron using the current strategy. Error factor (remember that this will vary based on the layer of a neuron) will be passed to the UpdateDelta function, from the functions in Neural Network class. UpdateOutput - Find the new output of the neuron, by finding the net value, and then by invoking the activation function - as defined in the current strategy. UpdateFreeParams - Updating free parameters includes calling the functions according to the current strategy of this neuron to find new bias and to update weights. How a Neuron actually functions is decided by the strategy of a neuron. A concrete strategy should implement the INeuronStrategy interface. This interface is shown below. 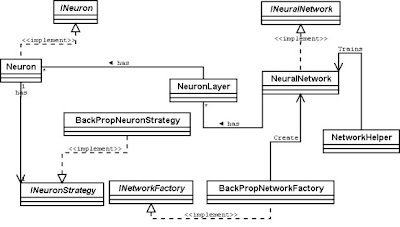 BackPropNeuronStrategy is a concrete implementation of INeuronStrategy interface. The elements in INeuronStrategy interface, along with description is given below. Have a look at the BackPropNeuronStrategy class, in the code, and see how these functions are implemented as we described earlier. It is pretty easy to understand. Now, let us see how the Neural Network is implemented. Any concrete neural network should implement the INeuralNetwork interface. INeuralNetwork interface is shown below. There are two interesting functions, TrainNetwork and RunNetwork, for training and running the network. The input to the TrainNetwork function is an object of TrainingData class. The TrainingData class has two properties of type ArrayList - Inputs and Outputs. To train the network, we put the input values to the Inputs array list, and corresponding output values are filled to the Outputs array list. Have a look at how this goes, inside TrainNetwork function in the NeuralNetwork class, it is commented heavily. Some part of TrainNetwork function is shown below. 'Give our inputs to the first layer. Running the network is pretty simple. For running the network, we just feed the inputs to the first layer, and calculate the outputs, just as explained earlier during the training phase. Here is some part of the RunNetwork function. Now, let us see how you can create a network easily. Here is a simple code that shows how to create a network. Let us assume that the input to the method is an array list which holds a list of long values that represent the number of neurons in each layer. Or better, you can use the BackPropNetworkFactory class to create a network easily. Have a look at the BackPropNetworkFactory class. It has two overloaded CreateNetwork functions, for creating a neural network. This article is much like a 'Developers Guide' of BrainNet neural network library. Have a look at my previous article if you haven't done that yet. 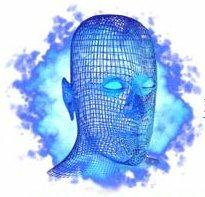 It is more or less a 'user's guide' for this library - for more information regarding how to use this BrainNet Library in your own projects, and to see the demo projects in action. Cheers!! Thus, we finished the second article about Neural Networks. Just turn back and make sure that you understood all the points clearly. I will explain how to create an XML based language yourself, for creating, training and processing neural networks. Explain the concept of some classes in the framework that I haven't mentioned in this article (like NXML interpreter, NetworkSerializer etc). There are some 'Easter Eggs' along with the BrainNet library source code, that I haven't mentioned right now. For example, If you are smart enough, start playing with the nxml tool, already included in the associated zip. The zip file holds the whole code. nxml is a command line tool which may help you to create, train and run a neural network using xml. I'll explain it in detail, in my next article. Anyway, after compiling the project, typing nxml in the command prompt will reveal its usage :) - just if you can't wait till my next article. Another demo project is a simple Handwriting detection pad, which is also available in the source code zip. Read all the articles I published so far here, http://amazedsaint.blogspot.com/. - You'll find articles about Design Patterns, Neural Networks, Security, Hacking and more. You can subscribe to the XML atom feed of my technical articles blog, for tracking new posts. Click Here for the XML Atom Feed. When you play with the library, if you come across any bugs, please report it. It's really wonderful and easy to understand post, but I couldn't exactly figure out for which platform code is, my best guess is that it is some kind of VB, and second thing that I couldn't figure out is how to train network for sets of inputs. It's pretty clear that I can pass (lets say values from AND truth table) 0 and 0 and iterate until it learns to get answer 0, but how then train for values (0;1), (1;0) and (1;1) ? Do I have to pass them again to same network and train it again till it learns combination (1;0) but by that time i think it would forget about (0;0) combination? or should there be some kind of other network? It would be very nice if you could explain that in more detail. I would like to estimate the weight value (output) when the flow (input paramter) = 350. Are you planning or having as future projects the inclusion of a regression neural network factory to your library? If no, can you share information about how to add it to your code or where we may find info about it? I will apreciate your help with this, and by the way you may add my request to you project list if you want!